Bubble Witch Saga 3 (Wilbur) is a casual bubble shooter where you have to rescue magic animals that have been trapped inside colorful bubbles. The evil cat, Wilbur trapped these adorable little creatures and is planning on becoming the most powerful wizard of all times. However, the good witch isn’t going to make it easy for him. 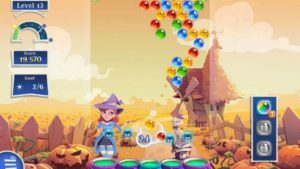 Bubble Witch 3 Saga – The brand new game in the popular Bubble Witch series. Stella the Witch is back and she needs your help to defeat the evil Wilbur in this exciting adventure! He may look cute, but he’s full of magical mischief! Travel the realm bursting as many bubbles as you can in this bubble shooting puzzle game. Celebrate Spring with Google Play and find spellbinding surprises in Bubble Witch 3 Saga for a limited time only! To clear the bubbles and free the animals, you have to throw other bubbles and match three or more of the same color. While this is the classic gameplay we’ve seen so many times before in hundreds of other games, King has added some interesting twists. You’ll need to find special balls, magic powers, and other surprises. Bubble Witch Saga 3 (Wilbur) is a fun and visually beautiful puzzle game that can provide hours and hours of fun for anyone who loves this genre. The graphics, while being somewhat repetitive, are really gorgeous. In Wilbur, you work your way through a map, just like in Candy Crush Saga and other similar games. To cross the map, you have to go along, unlocking all the game’s levels. And as usual for King, more and more will be created as they update the app. Take on this magical Saga alone or play with friends to see who can get the highest score! Bubble Witch 3 Saga is completely free to play but some optional in-game items will require payment. Bubble Witch 3 Saga – The brand new game in the popular Bubble Witch series. Stella the Witch is back and she needs your help to defeat the evil Wilbur in this exciting adventure! He may look cute, but he’s full of magical mischief! Travel the realm bursting as many bubbles as you can in this bubble shooting puzzle game. Take on this magical Saga alone or play with friends to see who can get the highest score! How do I play Bubble Witch 3 Saga? Tap and hold to aim, and release your finger to shoot the colored bubble at the top of your shooter. If your bubble lands in a spot near two or more same-colored ones, they will all pop! You have a limited amount of bubbles to shoot in each level. Nero is Stella’s faithful apprentice wizard. Despite his limited abilities, he is crucial to overcome the wicked bubbly challenges devised by Wilbur! How can I charge Nero’s Power? Discarding your bubbles: tap on Nero to send him the current bubble in your shooter, and he will transform it into a lot of magic charge! Matching bubbles: Whenever you make a match, the magic released in the explosion will charge the power. The bigger the match, the bigger the charge. How do I use Nero’s Power? Once it is completely filled, Nero will automatically put a powerful bomb in your shooter, with which you can clear an area of bubbles of any type. If you don’t want to use it at that moment, you can tap on the shooter to switch to other colored bubbles. Note: Due to changes in technology over time – such as new mobile devices coming into the market – it is possible that the game will experience performance issues or will no longer work as originally intended on certain devices. Bubble Witch Saga 3 aka Wilbur is yet another of the soft-launches released by the creators at King. It’s available in certain countries before the international release, as was the case withe Hero, the RPG for dummies released just a few weeks ago. This appears to be an early version of this game given its number (v0.0.13), but it is already totally functional and offers an endless number of levels. Bubble Witch 3 Saga is available on iOS (iPhone, iPad, iPad Mini) and Android devices. Please refer to the app store info to find out if your device is compatible with the latest version of the game.